Is your Association with The Scout Association UK or World Organisation of Scout Movement? No our Association is a completly independent Association, we are not connected to The Scout Association. The Baden-Powell Scouts' Association is a registered charity (no.278525) and is a proud member of the World Federation of Independent Scouts. "That Traditional lot are old-fashioned eccentrics"
Traditional does not mean old fashioned or boring. Tradition implies dependable quality. The word is used in advertising to help sell reliable products from traditionally brewed beer to traditionally built houses. We like to think the same qualities apply to our Association. We are not a watered down organisation nor cowboy-built! Our Scouting methods are so fundamentally sound, that we don't have to change, the system has worked for over 100 years! Our Packs & Troops go camping regularly. We have district camps and international camps. No - Our Leaders are 100% volunteers, we have no paid Leaders or executives in our Association. All our staff do what they do because they enjoy traditional Scouting. My friends say Scouting is Sissy! A lot of kids think this! 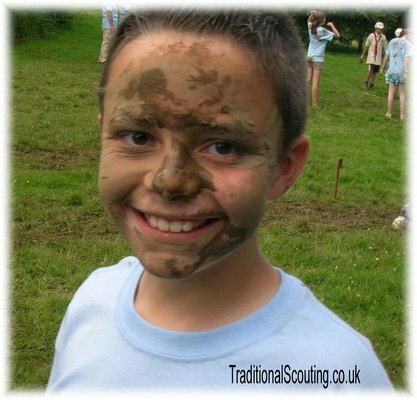 Outdoor activities, hikes, orienteering, camping in ALL weathers, hill walking, boating, pioneering - is NOT sissy stuff! Learning how to light fires with sticks is not sissy! Some of our Rover Scouts have climbed mountains higher than clouds in Yosemite - this is not sissy! Please use our contacts page to find a group near you or contact our Chief Commissioner and we shall try and facilitate you! I'm an adult, how do I get involved as a Leader? No problem! We look forward to your assistance - please Contact Us for more information.